Boy, I didn’t expect to have to do this club’s expansion draft list this soon but after last night’s flame out to the Fire, the Revs definitely deserve to be staring at their post-season plans today instead of from a week or two from now. I will go into what I think is next for the Revs and the other three conference semifinal losers next week. I figured though it would be a good time to continue on in the expansion draft coverage here. Anyways, today we shift our focus to the last of the playoff-less clubs, the Colorado Rapids. So far we have gone through Colorado, DC, Dallas, LA, San Jose and Toronto. Matt Reis – even though I have a hard time believing that Seattle would even take a keeper in this draft, it is still good to protect your all-time best keeper. Shalrie Joseph – I wonder if this could be the off-season that Joesph tries to go abroad again. Either way they have to protect their MVP. Adam Cristman – When healthy he has shown he can carry some of the load. Kheli Dube – A big year for this rookie, no way they would allow Seattle to have the chance to take this young star. Jeff Larentowicz – I think this guy along with Joseph are the two biggest players they have to protect. Seattle would love to get their hands on a Larentowicz. Kenny Mansally – One of the two young Gambians that they will protect. Sainey Nyassi – The other Gambian that will be protected. Michael Parkhurst – Their best defender, but I really truly wonder if he will even be a Rev next year or if he will be abroad. He will be out of a contract at the end of this year. I believe they’d still need to protect him in case they are able to resign him. Pat Phelan – There was a reason why they traded with Toronto in the midseason for Phelan. I believe he will be a big part of this club in the near future. Chris Albright – Veteran defender that Seattle would actually love to have even with a decent sized contract. Plus I look at him and think his leadership and value will be one that Seattle will want and something that the Revs cannot afford to give up. Think Nick Garcia and what he did for the Quakes this year. Khano Smith – I went back and forth on this one but I think Smith will be protected. Wells Thompson – At times I think he could be a protected guy but when I look at his season he didn’t exactly break out like most had hoped. Maybe a change in location would help that process along. Joe Germanese – A young defender that could be protected. I think he or Thompson will be protected if the Revs do decide to sell Twellman this off-season. They could unprotect Twellman and his contract anyways and protect one of these guys. Chris Tierney – Solid young defender that could be a good addition for Seattle. Taylor Twellman – I went back and forth on this one. But I think at the end of the day the Revs will make a decision to let Twellman go if they can this winter. Thus leaving him unprotected. Seattle won’t take on his high contract anyways. Steve Ralston – I think they could protect him but I just don’t see him going anywhere. Gabriel Badilla – New international player, just don’t see the likelyhood of him getting protected or even picked up by the Sounders. Mauricio Castro – If they know Parkhurst isn’t going or decide to not protect a Matt Reis then Castro will be on the protected end. But I don’t think it will matter because of his contract. Amaechi Igwe – Generation adidas contract, can’t be picked. I figure New England will have someone drafted to Seattle. It always happens that way. Teams want to be stable and solid like the Revs so they will try and take apart the Revs anyway they can in their selection. New England has to protect the right guys and will have to be crafty at the same time. Protect some young guns and some veteran players. I see Steve Nicol going out on a limb with some protections here in an effort to keep as much in tact as possible for next year. The thing is that will be really tricky unless they have a good idea of who is going this winter and who is not. This club will be very interesting to watch this winter and it really all starts with who and what they protect for this draft. Twellman has MAJOR value, even if he transfers, so that's worth protecting. Parkhurst is 100% gone so why protect him. They have offered him $300K and he's not interested so he won't be protected. PS. Good on yah for no longer plagerizing other pundits sights. You forgot Heaps, but I think he’ll be fairly safe to leave unprotected because of age/ability. 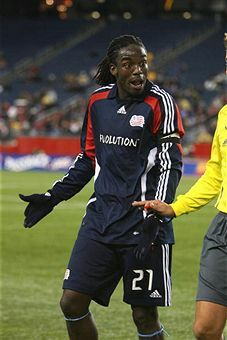 I think the Revs will leave Mansally exposed and maybe Cristman or Dube. Those 3 all have some upside, but are far from the sure thing that an expansion team will be looking for. Albright gets exposed because of his large salary. And Igwe should replace him next season. I think the Revs would actually be thrilled if Seattle takes Albright off their hands. Tierney gets protected, because Nicol really likes him and he’s young, smart and cheap. Ditto with Phelan – Nicol’s gonna make a player out of him. And, they are both local kids. Ralston has to be protected for the “Okaroh” factor. Twellman has MAJOR value, even if he transfers, so that’s worth protecting. Parkhurst is 100% gone so why protect him. They have offered him $300K and he’s not interested so he won’t be protected. You forgot that Badilla and Castro are both international players and acording to the rules all but 1 needs to be protected which means that one of your protected 11 must be left exposed. I would not be surprised if he finds a team in Europe. Joseph is potentially the best center midfielder in this league. I enjoy watching him play. He knows what to do with and without the ball. He can defend and attack. He is good in the air, too.